San Luis Obispo County, CA (May 18, 2015) â€“Sunset SAVOR The Central Coast, Californiaâ€™s premier food, wine, travel and lifestyle event, reveals details surrounding its all-new opening night experience, Strings at Sunset. This highly anticipated taste bud-tempting, gasp-worthy kickoff will be held at Vina Robles Amphitheatre on Thursday, September 24, 2015. Featuring theatrical performances from award-winning artists String Theory and DJ Violinist SPAGS, Strings at Sunset attendees will also enjoy wine pairings from the 2015 Sunset International Wine Competition winners, celebrity chef tastings, and more. Buy One Get One VIP Admissionâ€“ Guests who purchase their $100 Main Event Weekend Pass in May are eligible to receive two VIP Strings at Sunset tickets for the price of one! Buy One Get One General Admission â€“Purchase one General Admission Opening Night ticket and get another free! Throughout the evening, dine with celebrity chefs and culinary personalities including James Beard Award-winning author of Kitchen Gypsy (September 2015), international cooking teacher and chef, Joanne Weir, as well as popular food blogger, culinary instructor and author of Eating Up the West Coast (April 2015), Brigit Binns. Stay tuned for more celebrity announcements! Strings at Sunset is a can-t-miss event and offers a truly unparalleled food, wine, and musical experience. Whether attending Sunset SAVOR The Central Coast for the first or the sixth time, you are in for an evening of phenomenal and delicious surprises,â€ said Peggy Northrop, Sunset Editor-in-Chief. String Theory -String Theory is a hybrid performance ensemble that combines their signature gigantic architectural harp installations with original music, dance, and projections, transforming the stage into a giant musical instrument. SPAGS - Jennifer Spingola, known as â€œSpagsâ€, has been amazing audiences around the world for years now with her virtuosic technique, inventive arrangements, and compelling performance style. Widely known on the scene as "the DJ violinist," Spags creatively merges the classical violin world with the modern music world. Â·Access to exclusive â€œSparkle Loungeâ€ featuring intimate seating, delectable desserts, late harvest wine and lots of bubbles. Volvo, the creator of high-end luxury vehicles, hosts the ultimate VIP Ride and Drive Experience. Guests looking for the ultimate VIP experience are picked up in style at the Paso Robles Inn and will enjoy a scenic drive through Paso Robles Wine Country before arriving at Strings at Sunset. Strings at Sunset will be held from 5:00 p.m. until 9:30 p.m. with VIP Admission beginning at 5:00 p.m., and General Admission entry starting at 6:00 p.m. VIP Tickets are priced at $150 per person and General Admission are priced at $85 per person. 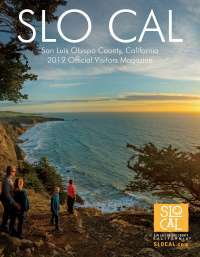 About Visit San Luis Obispo County: Visit San Luis Obispo County is the countywide destination marketing organization and promotes San Luis Obispo County through advertising, marketing, public relations, travel trade, events, and sponsorship. It is comprised of over 500 tourism industry-related businesses including lodging properties, restaurants, wineries, activities, golf courses, and retail stores. Sunset SAVOR the Central Coast is managed by the Bureau. For more information on Visit San Luis Obispo County, please visit www.VisitSanLuisObispoCounty.com. About Sunset: Sunset (www.sunset.com) is the leading lifestyle brand in the West. Through magazines and books, events and experiences, and digital and social media, Sunset covers the West&apos;s best flavors, destinations, design trends, and innovations. Sunset engages and inspires an audience of over six million educated, active and affluent consumers every month through its five regional print editions "Pacific Northwest, Northern California, Southern California, Southwest and Mountain as well as via all tablet devices and its website. In addition to its print and digital publication, Sunset showcases the regionâ€™s unique lifestyle and noteworthy destinations through its flagship events, established home programs, licensing partners, books and International Wine Competition. Sunset is produced by Time Inc. (TIME), one of the largest media companies in the world. About Fast Forward: As an award-winning turnkey event management, public relations and marketing solutions provider, Fast Forward specializes in the creation of world-class trade and consumer events, brand activation and experiential marketing strategies. From elite wine and food experiences for thousands of discriminating palates to intimate brand-to-press networking events in the heart of Manhattan, productions by Fast Forward Ventures accelerate human connections, put brands in front of key influencers, and deliver an unparalleled return on experience. Fast Forward Ventures is the producer of Cooking Light & Healthâ€™s The Fit Foodie 5K Race Weekend, Editor Showcase NYC, SommCon USA, and the San Diego Bay Wine & Food Festival, Southern Californiaâ€™s largest luxury wine and culinary experience now in its 12th year.